Coe Press Equipment, Sterling Heights, MI, introduces a 10,000-lb.-series coil reel developed to serve press lines handling heavy coils in widths from 12 to 36 in. Capable of processing a full range of materials, the coil reels fill a gap between small-capacity reels and heavy-duty large systems. Combine the reel with a traveling coil car to provide a modular, cost effective unwinding solution that can be matched with servo roll feeds and power straighteners to provide full system capability. The new reels can be configured to work in a pull-off application with power straighteners and rollforming equipment, or provided as motorized payoff reels with the drive mechanism to unwind the coil built into the machine. Standard features include heavy-duty welded construction, three-pad mandrel construction and manual hand-crank expansion. 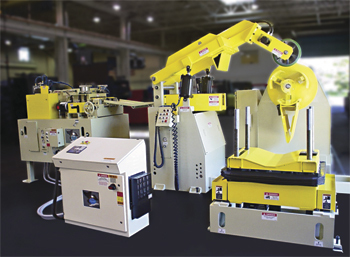 Options include hydraulic expansion, a hydraulic threading drive and holddown arms with or without motorized end wheels.